The aeronautical and astronautical engineering grad and former Illini football player will speak to the graduates on May 17. Astronaut Mike Hopkins will give the keynote address at the 2014 University of Illinois commencement next month. Hopkins, a 1991 UI engineering graduate and former co-captain of the Illini football team, just returned from six months aboard the International Space Station. He will speak at the campuswide commencement scheduled for 9:30 a.m. May 17 at Memorial Stadium. The ceremony was moved there this spring because of the renovation underway at the State Farm Center. He said the location is particularly poignant for him as a former football walk-on. The NASA flight engineer blasted into space on Sept. 25 with two Russian cosmonauts and logged more than 70.4 million miles aboard the station, orbiting the Earth 2,656 times. Hopkins kept in touch with his alma mater while in space, hooking up for a live interview with aerospace engineering students via satellite in October and filming promotional spots for UI athletics and the Big Ten Network. He also tweeted dozens of photos from the space station, including a shot of Champaign-Urbana. 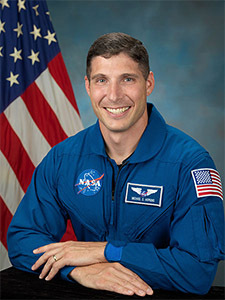 Hopkins earned his bachelor's degree in aeronautical and astronautical engineering from the UI. He chose the university for its highly rated engineering school but also decided to walk on to the football team in 1988. He won a scholarship, became a starter and was team co-captain as a senior, playing defensive back and going to four bowl games.